Do you know about alternatives to detention in North Africa? The State Council has critiqued the Belgian Government for its use of immigration detention for children. Belgium law, passed in 2011, prohibited the detention of children except in exceptional circumstances when the detention center had been adapted to the needs of children and families. Alternatively, families would live in private housing under specific conditions formulated in an agreement between the family and Immigration Office, with sanctions imposed on the family if the agreement was not respected. In 2014 a Royal Decree passed setting the content of the agreement stating the entire family, or a single member of the family (usually the father) could be held in closed detention if the family neglected the provision of the agreement. The State Council analyzed the 2014 Royal Decree, stating that it interferes with the child’s right to family life. In practice, children are being separated from one of their parents who is placed in detention to motivate families to comply with return orders from the State. Both the European Convention on Human Rights and the Belgium Constitution guarantee a child’s right to family life. The State Council also stated that the government is not currently meeting the requirement to adapt detention centers to the needs of children. 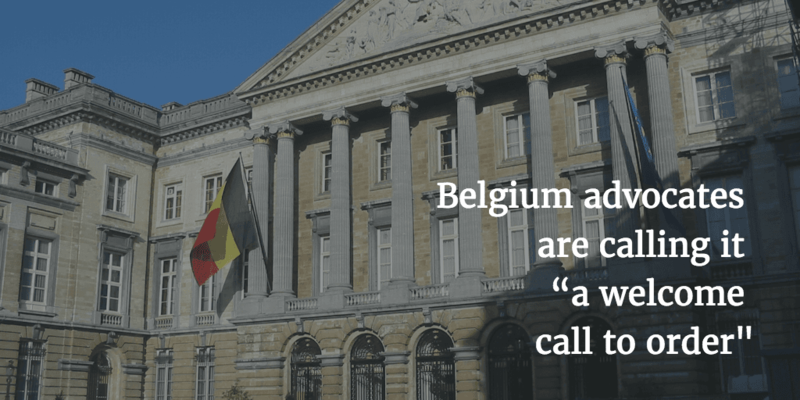 Belgium advocates are calling it “a welcome call to order”, urging government to end child detention and comply with international legal obligations. The UN Committee on the Rights of the Child have stated that detention is never in the best interests of a child and that alternatives to detention in child-appropriate contexts should be sought.